In another of our series of choko recipes, this is a variation on the classic potato dauphinoise, only with pumpkin, choko and radishes. Slice the ingredients thinly, using a mandolin or knife. Then layer the vegetables in a small, high-sided baking dish. Alternate the ingredients, adding small knobs of butter as you go. I also added some dried sage (home-made of course! ), salt and pepper. Then pour in cream, to come up the level of the vegetables. Bake in a 180°C oven for 45mins. I then added a layer of grated cheese (why not! ), and baked until golden brown. 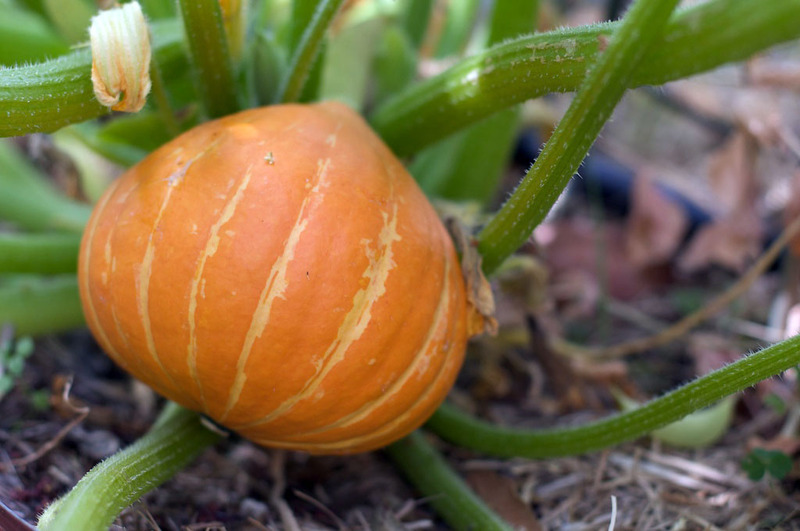 This entry was posted in Cooking, Growing our own food and tagged choko, cooking, pumpkins. While the Sydney climate is tremendously mild, which is great for many crops, it also encourages the growth of a heap of pests and diseases. In particular, we’ve had little luck with pumpkins, cucumbers, and many types of beans and peas. Inevitably, they get attacked by powdery mildew, and that’s the end of them. While I’ve found resistant varieties of peas and beans, I’d pretty much given up on pumpkins, etc. So when one self-seeded in the garden in spring, I let it run, to see how long it would last before the mildew killed it off. The answer turned out to be: a long time, as evidenced in the picture above. I think these are Queensland Blues, or similar, and they grew with great abandon, producing fruit after fruit. In total, we harvest five pumpkins, with a total weight of approx. 21kg. This entry was posted in Growing our own food and tagged diseases, powdery mildew, pumpkins, summer. Now that the holiday season has passed, it’s probably time I got back into the blogging. 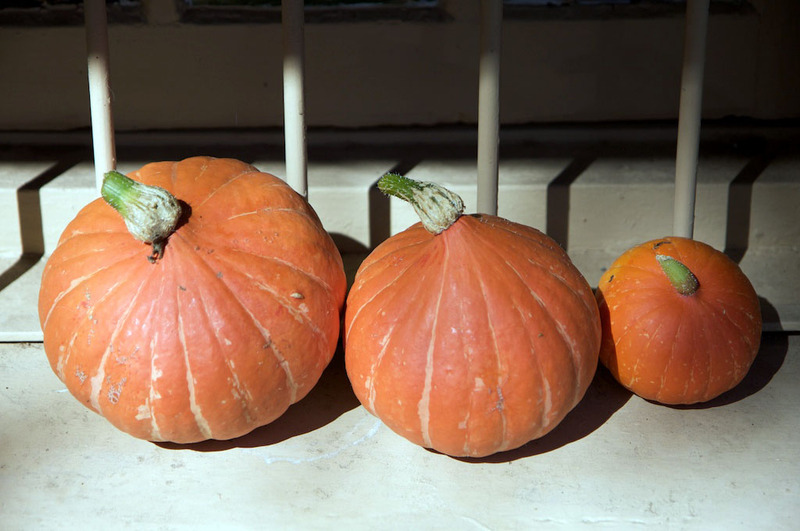 Let’s kick things off with our first three pumpkins out of the garden. Our small variety have gone great, with three more pumpkins on the way. Our large pumpkin plants seem more intent on taking over the world than producing edible bounty. Following instructions I read somewhere, I’m drying out the pumpkins for a week, and then putting them under the house where it’s cool and dry. Apparently leaving on some of the stalk improves their shelf life. This entry was posted in Growing our own food and tagged pumpkins, summer. Last week I was in Northern California for work, and pumpkins were everywhere. Piled up in fields, filling fruit vendor’s stalls, on window sills and beside doors. It was definitely the season for pumpkins. I was therefore excited to come home to some pumpkins of our own. I stashed seeds in corners throughout the gardens, and all have been growing well. The smaller “Small Sugar” variety have been the stars, flowering early under large healthy leaves. We’ve been getting the hang of hand pollination. The female flowers have a round bulb at their base (which becomes the pumpkin), and pollen from the male flowers is hand deposited onto them. The only challenge was that for the first few weeks we’d get one flower at a time, either male or female but never both. Very frustrating! This entry was posted in Growing our own food and tagged pumpkins, spring. Despite the earlier bad news, the first of our bush beans are pushing themselves forcefully out of the ground. They are a week late, so perhaps seed storage in the fridge put them into a dormant state, rather than killing them outright. 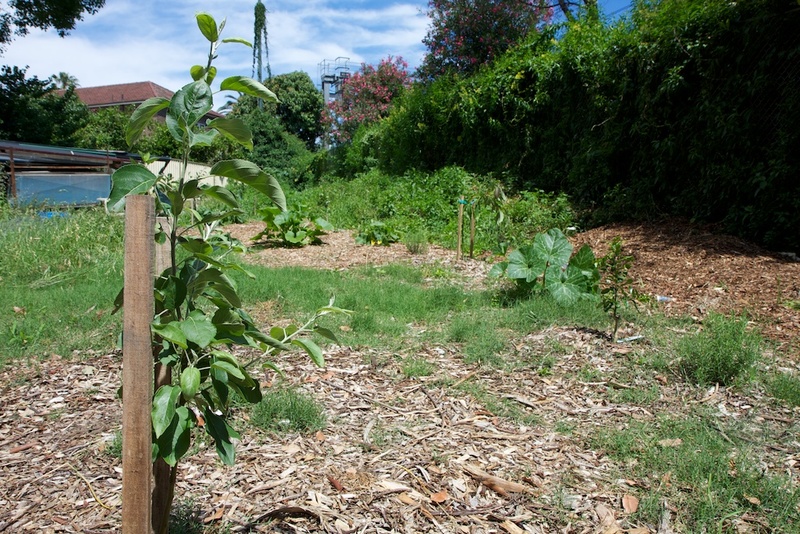 This entry was posted in Growing our own food and tagged beans, pumpkins, spring.